There are so many options when choosing Lockers. 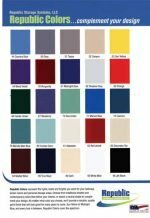 Down with the drab colors of years past and choose a locker color that matches the school colors, gym style, brand or decor. Choosing a better locker color is now possible and Centar makes it easy. Centar has several different color charts to choose from and it depends on the brand of locker as well. Whether it is the Penco, Republic, Lyon, Debourgh or the List Color Chart. We have the right color for your school, gym, or business.